Tanzania is the postcard of Africa come to life. Formed by the union of Tanganyika and Zanzibar in 1964; Tanzania is the land of great safaris and, as one of the oldest continuously inhabited places on Earth, the birthplace of the earliest human ancestors. Because of vast swathes of savannahs and distances between sites; bringing your own transport accommodation and personal comforts by Tanzania 4WD campervan rental is most suitable. You can plan around exploring the country on your own; or benefit from the local knowledge and experience of a safari operator or naturalist guide to enjoy Tanzania’s multitude of offerings. 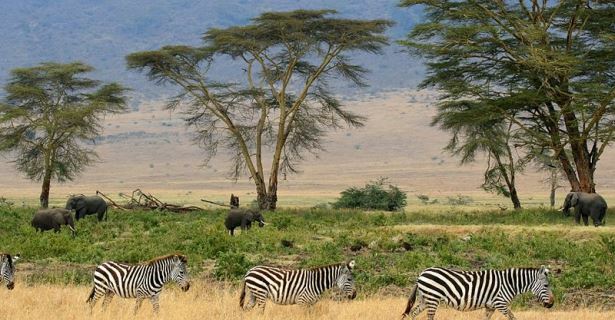 Tanzania is the African destination that is most synonymous to safari. The country leads the pack in ‘Big Five’ safaris, so you are sure to tick off on your list the lion, leopard, elephant, rhinoceros and Cape buffalo. If you fly into Dar es Salaam; it’s a 600-mile drive by Tanzania 4WD campervan rental to the north to reach the Serengeti Plains. A shorter route would be to fly to Mount Kilimanjaro airport; and then drive some 200 miles west to the Serengeti. After scaling Africa’s tallest peak – the one with the icing on the top; spend a day or two in the campsites around the ‘cradle of civilization,’ the Ngorongoro Crater. Hike the Crater highlands with a red-garbed Maasai guide; or park your 4WD campervan hire in Tanzania at the Olduvai Gorge to ponder the existence of the earliest humans. Understandably, the northern safari circuit gets plenty of media coverage; but Tanzania has numerous national parks in the south that are worth your exploration by 4WD camper hire in Tanzania. An alternative safari circuit would be to drive from Dar es Salaam to Selous Game Reserve 200 miles south; then on to Mbeya, gateway to Lake Tanganyika, for another 276 miles; and finally, 143 miles north to what many consider as one of Tanzania’s finest national parks, Ruaha. You can then drive back your Tanzania 4×4 campervan rental to Dar es Salaam; perhaps after picking up a Makonde wood carving along the way, and bask in the often overlooked Indian Ocean coast. Here, white sand beaches and turquoise waters teeming with multi-coloured corals, rainbow-colored tropical fish, and nesting sea turtles will complete your Tanzanian holiday. Enjoy a slice of Tanzania’s coastline dotted with serene islands and laidback fishing villages in Dar es Salaam itself. Leave your Tanzania 4WD campervan rental in Dar and hop on a three-hour ferry ride to honeymooner-favourite Zanzibar, or travel 100 miles south to Mafia Island for a go-slow vibe, a smattering of ruins and slips of pure white sand for a fraction of Zanzibar’s crowd. Closer to the Mozambique border is Mikindani where European colonization made its indelible mark and where the Swahili culture remains alive and well despite all the city’s slave trading past. Having a 4×4 campervan rental in Tanzania will also make it bearable to travel in intense heat during the hottest months, which are from January to February, when massive herds of elephants, zebra, buffalo and hippos congregate in shrinking watering holes in Serengeti. While even locals complain about the heat, these months are the best to watch the epic migration of a million-strong wildebeest as they make their way to Maasai Mara in Kenya. The months of June to September are milder with lower humidity, and the best months to enjoy Tanzania’s beach scene. Keep in mind that during the rainy months of March to May; national parks are often closed and dirt roads impassable.